Whenever possible, double channel frames that accommodate both the stained glass windows and their protective glazing should be used. Their use facilitates the installation, and any future removals, of either glass panel without affecting the other. We recommend the frames of the J. Sussman Company. Aesthetically, these frames are preferential as well, since retrofitted “storefront” frames become wider with the necessary framing add-ons. This increased visual mass is more intrusive on the stained glass design than the double channel frames. It is also more expensive to retrofit “storefronts” than to use the double channel frames from the beginning. This thermally broken, double channel frame accommodates both thermopane and stained glass. 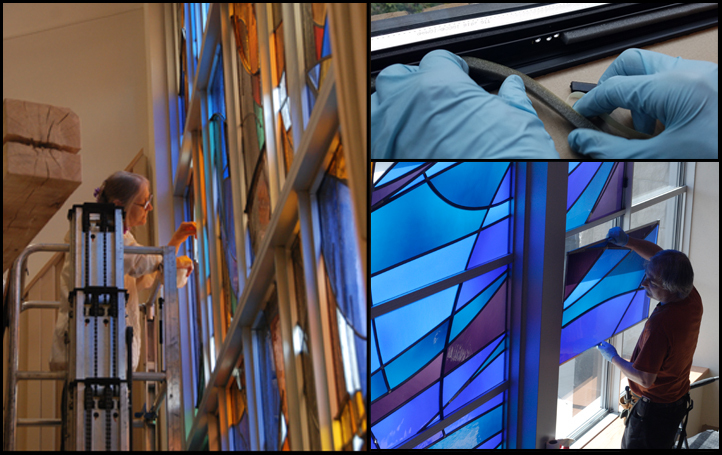 Thermopanes are installed from the exterior of the structure, while the stained glass is installed from the interior. Neither glass panel need be removed to access the other-- an important consideration should repair work ever be needed. These frames are also the most energy efficient available. Interior-only mullions with 6400 Series. Although thermopanes can be very large, stained glass windows should not be too large (generally not exceeding 14 linear perimeter feet). This frame is built with mullions that subdivide the overall art-glass into smaller sized units. Almost any curtain wall or storefront style frame can be retrofitted to accommodate stained glass. This involves attaching low-profile stained glass frames to the sides of the storefront frames. Although this is an easy way to install stained glass windows to existing windows, it is definitely not the preferred method for new construction. Retrofitting storefront frames is very time intensive (expensive) and increases the visual mass of the frames. For new construction, always use the double channel frames shown above. Single channel glazing is used in a retrofit situation where exterior protective glazing already exists, and a stained glass channel was not provided for. Stained glass should never be installed as single glazing against the elements. New frames are screwed to the existing frames, which then accommodates the stained glass window with a snap in bead. Drawbacks; Reduced visuals & difficult maintenance. Small windows, under 14 linear perimeter feet. Large window, exceeding 14 linear perimeter feet. 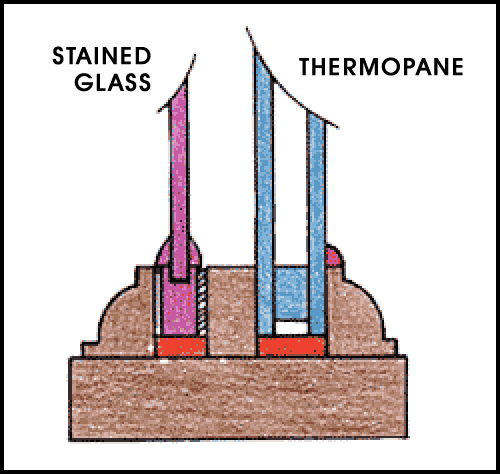 Although thermopanes can be very large, stained glass windows cannot. A new frame is built with mullions that subdivide the overall art glass into smaller sized units. This frame is then installed inside the existing frame. Installing into wood frames is most commonly found in residential locations. 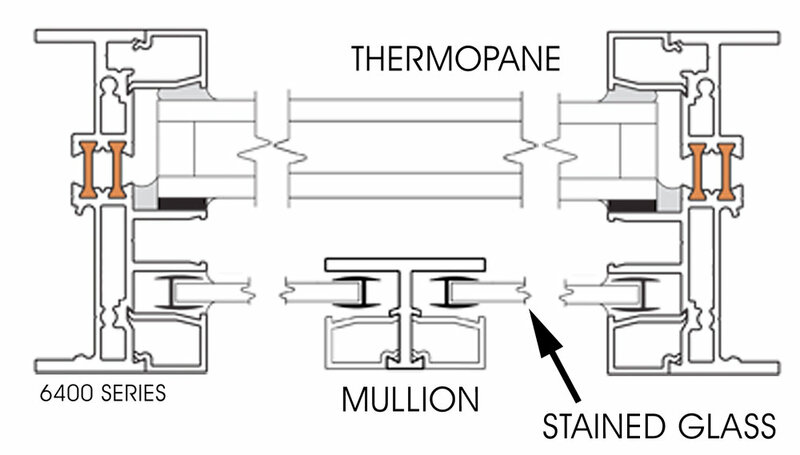 As illustrated, the main requirement is a spacer trim, generally 1/2"- 3/4" wide to separate the stained glass from the thermopane. As with any stained glass window, each individual panel should not exceed 14 linear perimeter feet. Kessler Studios adheres to the rule-of-thumb concept that no single stained glass panel should exceed 14 linear perimeter feet. This means that one should be able to measure the perimeter of each stained glass panel and that total should be less than 14 feet in length. Keeping panels within this size ensures that the windows will be structurally sound. Here is an example of an existing curtain wall with many large exterior thermopanes. Note the units along the top. The stained glass panels could not be built so large, so add-on frames were specified. 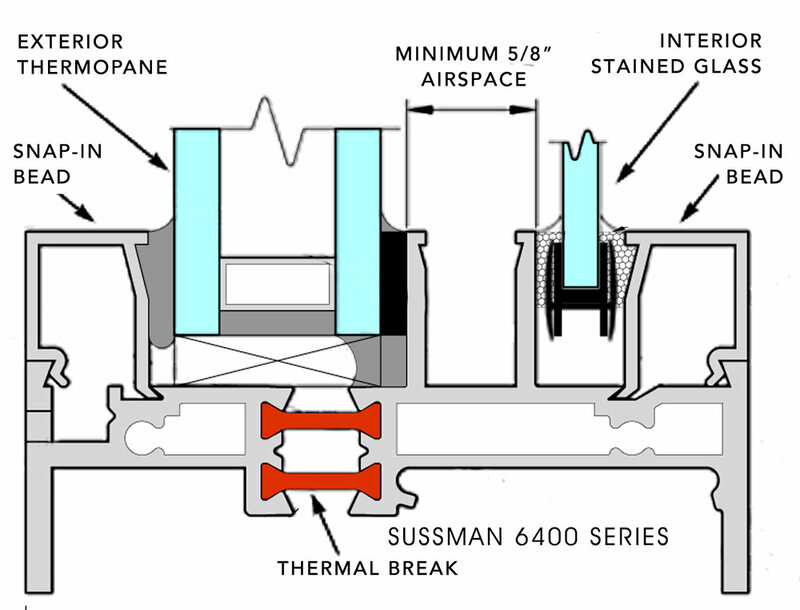 The ideal situation would have been to originally use a double channel frame, such as Sussman 6400 with built-in divisional mullions. This approach would have minimized the visual intrusion of add-on frames. Here is the project with the add-on frames and art glass installed. In some sections the windows were divided into as many as three panels. Stained glass is so demanding of attention that the additional structural elements go virtually unnoticed. It is nearly impossible to give a general weight for finished stained glass panels. Aside from the overall size of a panel, another factor is the lead came which comes in many sizes. Kessler Studios uses various lead widths to add an expressive element to the design. Thus, while a very simple design might top out at 2-3 pounds per square foot, a complex panel might weigh 4-5 pounds per square foot... or more! Despite this wide range, finished panels still are not a significant weight (compared to 1-1/4" thermopane fabricated out of plate glass). All frame manufacturers factor in these variables and size the frame stock accordingly. Many commercial frame suppliers will claim to have a frame that will work with stained glass panels. This is NOT the case. There are manufacturers who produce specialty frames which accommodate both exterior protective glazing and interior stained glass panels. Kessler studios uses the frames of the J. Sussman Company and highly recommends their product. Kessler Studios can specify frames for a project, or serve as a consultant for the glazing contractor.